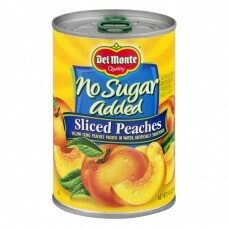 Del Monte® No Sugar Added Sliced Peaches. Quality. 1/2 The calories and sugar of peaches in heavy syrup. Yellow cling peaches packed in water, artificially sweetened. Net Wt 14.5 oz (411 g). Now you can enjoy the same delicious, high quality, great tasting fruit you've come to trust from Del Monte® with no added sugar. With Del Monte No Sugar Added, controlling your sugar and calorie intake doesn't mean sacrificing taste! Picked and packed at the peak of ripeness. Peaches NSA 35 calories, 7g sugars per serving; Peaches in heavy syrup 100 calories, 21g sugars per serving. Packed in U.S.A. Please recycle. Questions or Comments? Call 1-800-543-3090 (Mon.-Fri.). Find great recipes at: www.delmonte.com. © Del Monte Foods. Refrigerate any unused portion in a separate, covered container.